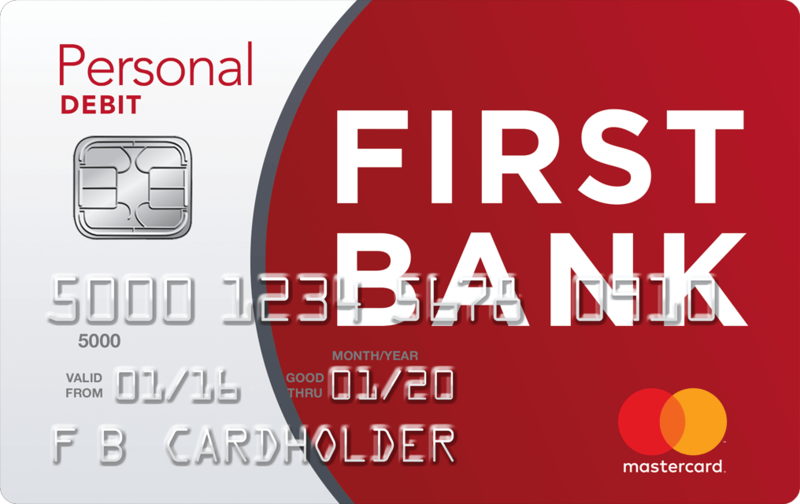 Big or small, the First Bank debit card does it all. Choose the card that ensures every transaction is secure worldwide, provides zero liability, and lets you manage accounts online, all while you’re earning rewards points on qualified purchases. With our debit card with rewards you can earn 1 point for every $3 spent on qualified purchases. Calculate your points using your monthly purchases with our rewards calculator in the tab above. Sign up for rewards today. Pay only for purchases which you have authorized on your MasterCard®. Unauthorized purchases are not your responsibility. Protect yourself from fraudulent use of your card information online when you register your card with MasterCard SecureCode™. Reduce your risk of identity theft with this service that constantly monitoring websites and chat rooms where criminals buy, sell, and trade stolen identities. Should we detect any evidence of your information being traded or sold online, you'll be alerted immediately. A quick and easy way to use your First Bank debit or credit card on the go with most smartphones. Learn how. Use your card anywhere you see the MasterCard® symbol displayed. Automatic billing updater is a convenient way to ensure your recurring payments continue when a new card is issued. This currently works with many national retailers, and we are continuing to expand it to more businesses. Should you find a lower price for a new item using your eligible MasterCard®, you may be reimbursed for the price difference. Call MasterCard® at 1-800-622-7747 for more information about available coverage. Doubles the original manufacturer’s or store brand warranty for up to one year when you pay with your eligible MasterCard®. 1. Free ATM network includes First Bank and CashPoints® terminals. Out of network terminal owners may charge a service fee. See our Terms and Conditions for complete details on our MasterCard® programs. Using your First Bank MasterCard® for everyday and monthly purchases can lead to big rewards! Start earning points when you enroll your card today.